The Federal Reserve has raised rates twice since the 2016 US election and eyes are now on the future path of the Federal Funds rate, which depends crucially on the Fed’s view of the neutral rate of interest. This column argues that that current policy may be at or close to the natural rate, and that the forces that have led to the low rates are unlikely to be reversed in the immediate future. It also identifies measures that could eliminate secular stagnation via appropriate policy, should negative rates persist. The election of Donald Trump sent shockwaves through markets in the US and around the world; the bond market was no exception. In the overnight markets after Trump’s election on 8 November, stock prices initially fell and bond prices rose as investors fled to safety. However, in subsequent days, investors reconsidered. Trump’s promised wave of infrastructure spending and lower taxes spurred expectations of increased federal debt and higher inflation. With Republican control of Congress, investors attached a high likelihood that these policies would be quickly implemented. Treasury bond prices plunged, and the 30-year bond yield climbed the most in one day since 1977. The US 10-year bond yield rose 20 basis points, or 0.2 percentage points, to 2.06 points (see Figure 1). And since then, bond yields have risen to a higher level with the 10-year yield at 2.39 by the end of March. The neutral rate of interest is somewhat of a chimera since it is a theoretical object and not measured directly in the data. Rather, it must be inferred using a model. For decades, economists regarded this rate as stable and around 2%. However, starting in October 2015, there has been a re-evaluation in Fed thinking about the neutral rate. In the October 2015 meeting, the Fed had a comprehensive discussion of the neutral rate of interest (Yellen 2017). Board members discussed the breadth of the evidence that suggested that these rates had declined in the US and abroad and had been declining for some time. The median assessment by Federal Open Market Committee participants of the longer-run level of the neutral federal funds rate fell from 1.75% in June 2014 to 1.5% in December 2015, and then to 1% in December 2016. The main drivers of the low rate, according to the Fed, are slow productivity growth and an ageing population, both in the US and other advanced economies. Since the actual real Federal Funds rate is around -1% today, the Federal Reserve considers its policy to be accommodative. Some data are supportive of this: employment has been growing at a pace of around 180,000 net new jobs per month, above a level which is consistent with long-run trend in labour force growth. Other data are less supportive: inflation has remained sluggishly low, with core inflation yet to rise above 2%. To understand whether or not the Fed’s stance is accommodative requires a step back from the day-to-day undulations of the market to a longer-term view of interest rates. 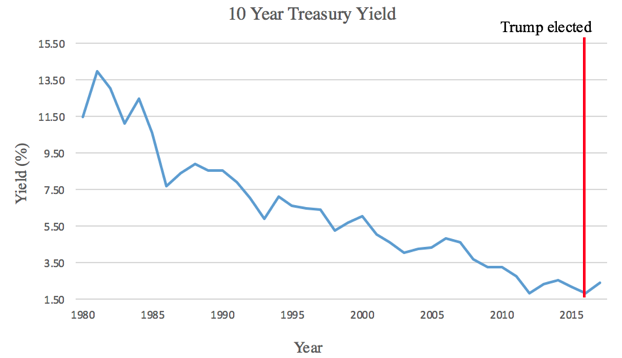 Figure 2 shows interest rates since 1980. 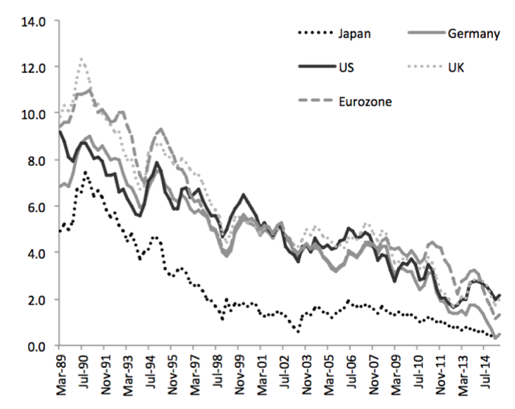 Figure 3 shows interest rates for several European countries and Japan. Several facts are immediately clear. First, even after the post-Trump rally, interest rates are at their lowest levels in a generation. Second, these low interest rates over the past few years are not an anomaly caused perhaps by the financial crisis – they represent the continuation of a 25-year trend. Third, the decline in interest rates is observed in all major industrial economies. Interest rates remain near zero in Europe and Japan. In a recent paper, we quantitatively analyse the reasons why real interest rates are so low, and why they have decreased over the past generation (Eggertsson et al. 2017). Two of the main forces we analyse, emphasised by the Federal Reserve, are demographic change and a slowdown in productivity growth. We also consider a variety of factors suggested by Lawrence Summers, who has forcefully argued that the natural rate of interest has decreased in the US, as well as factors suggested by recent economic research. Why did interest rates start declining in the 1970s? The data suggest a number of structural changes in the US that began around 1970. The work of Robert Gordon indicates that productivity growth slowed beginning 1970. Greenwood et al. (1997) and Fernald (2012) have documented that the relative price of investment goods has fallen by 30% since 1970. Karabarbounis and Neiman (2014) and Elsby et al. (2013) have provided data showing the labour share has declined substantially since 1970. The children of the baby boom started entering the labour force in 1970, and began to reach retirement in 2010. To understand how all of these factors affect the natural rate requires a model of the US economy that captures all of these forces. To do so, we build a large-scale 56 period lifecycle model with a variety of features that capture the determinants of the supply and demand for savings, and thus determine the equilibrium interest rate. We introduce a realistic demographic structure, with fertility and mortality rates taken directly from US data. Individuals save for their retirement and to leave bequests for their children. Productivity growth rates are directly taken from US historical estimates. Firms demand savings to invest in capital, whose relative price may change over time. We introduce monopolistic competition in production with increasing market power over time to match the decline in the labour share. Our analysis begins in 1970, before the decline in interest rates. We then input the structural changes in our model one by one, and study their effect on the equilibrium real interest rate. 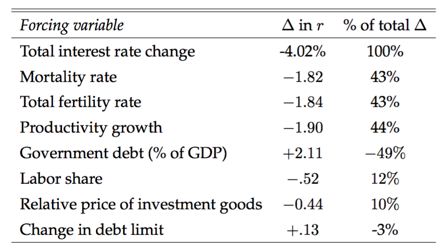 Table 1 decomposes the contribution of each of these factors to the decline in interest rates. Through the lens of our model, the reduction in fertility, mortality, and the rate of productivity growth play the largest role in the decrease in real interest rates. The main factor which has tended to counterbalance these forces is an increase in government debt. Changes in the labour share and the relative price of investment goods play a smaller role, as does the increase in consumer debt. 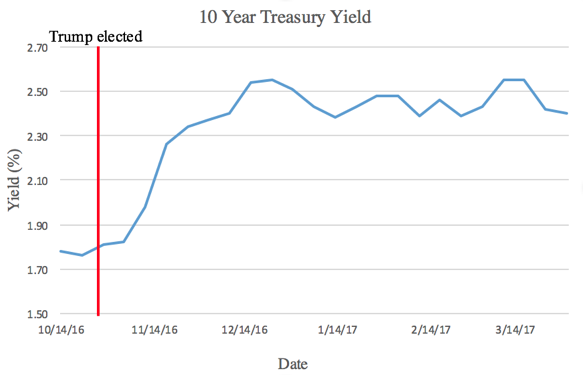 With all factors set to their levels in 2017, our model’s equilibrium natural rate of interest is -1.6%, lower than the Fed’s current estimate. In other words, our model suggests that current policy may be at or close to the natural rate. Furthermore, if the natural rate is indeed negative, this poses a challenge for policymakers. With a 2% inflation target, small shocks will cause the zero lower bound to bind, implying that downturns may be sharper and more persistent. Moreover, our analysis suggests that the forces that have led to the low rates, namely sluggish population and productivity growth, are forces that are unlikely to be reversed in the immediate future. We next consider an alternative thought experiment, taking as a given that the natural rate is negative. We ask, what economic conditions would be needed to increase the natural real interest rate to a positive level of 1% - the Federal Reserve’s estimate of the long run neutral rate of interest? Table 2 provides the results of this experiment and shows that substantial changes in the underlying fundamentals are needed in order to increase the natural rate to 1%. Given current demographic trends, it is implausible that fertility will reverse its decline and dramatically increase to 3.28 births per woman. An increase in immigration could make up a portion of the difference. It would also be a challenge to increase productivity growth to 2.4% per year given the headwinds to productivity noted by Gordon (2016) and the fact that productivity growth has rarely exceeded 2% since 1970. Of particular interest is the potential impact of an increase in government debt on interest rates, particularly given the potentially large deficits implicit in the Trump administration’s stated policies. As Table 2 shows, government debt would need to double to roughly 215% of GDP to increase the natural rate to 1%. Such a large level of debt raises questions about the feasibility of this policy, for we have not modelled any costs or limits on the government’s ability to issue risk-free debt – an assumption that may be strained at such high levels. The main takeaway of our analysis is not that the zero lower bound will be binding forever with certainty; a world of low natural rates admits business cycles in which the short-term rate can still be temporarily positive. However, it is a world characterised by a new normal, in which real interest rates need on average to be negative to achieve full employment. If negative rates persist, our analysis has identified several measures that could eliminate secular stagnation via appropriate policy. A serious challenge, however, is that our policy recommendations advocate in favour of policies that were considered vices rather than virtues in macroeconomic theory: a higher inflation target, persistent increases in the debt-to-GDP ratio, or even more generous pay-as-you-go social security. This poses a new set of tradeoffs for policymakers, who cannot know with certainty if we are indeed in a ‘new normal’ or just in a prolonged period of low interest rates that will abate in the near future. Carew, S (2016), “US Stocks, bond yields jump after Trump shock, Mexican peso falters”, Reuters Business News, 9 November. Eggertsson, G B, N R Mehrotra, and J A Robbins (2017), “A Model of Secular Stagnation: Theory and Quantitative Evaluation”, NBER Working Paper No. 23093. Elsby, M, B Hobijn, and A Sahin (2013), “The Decline of the US Labor Share”, Brookings Papers on Economic Activity 44(2): 1–63. Fernald, J (2012), “A Quarterly, Utilization-adjusted Series on Total Factor Productivity”, mimeo, Federal Reserve Bank of San Francisco. Gordon, R J (2012), “Is US Economic Growth Over? Faltering Innovation Confronts the Six Headwinds”, NBER Working Paper no. 18315. Greenwood, J, Z Hercowitz, and P Krusell (1997), “Long-run Implications of Investment-Specific Technological Change”, American Economic Review 87(3): 342–362. Karabarbounis, L and B Neiman (2014), “The Global Decline of the Labor Share”, Quarterly Journal of Economics 129(1): 61–103. Ronalds-Hannon, E, and S Barton (2016), “Treasuries Plunge Most in Four Decades As Trump Spurs Selloff”, Bloomberg Markets, 9 November. Summers, L H (2014), “US Economic Prospects: Secular Stagnation, Hysteresis, and the Zero Lower Bound”, Business Economics 49(2): 65–73. Yellen, J L (2017), “From Adding Accommodation to Scaling It Back”, Speech at the Executives' Club of Chicago, 3 March.